Mandarin Motion ‘Beach Clean Up’ Workshop! The kids and I, through researching the problems that rubbish is causing in the Himalayas, alongside our necessity to be able to drink safe water, have had to rethink our habits. When we first booked our flights for our adventure, we immediately got to work on a digital and wall family/team emblem to encompass everything this adventure means to us. Our ‘footprints’ around the mountain represented each one of us, training together and supporting each other as a team, then walking amongst the majestic mountains! But they also represented our intentions to leave only ‘footprints’. 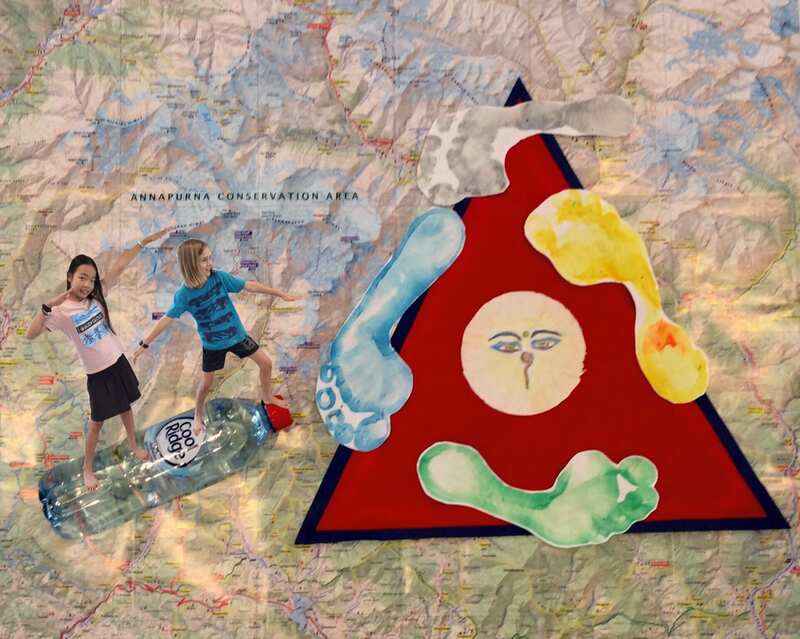 The kids made the above picture to depict how tricky it has been balancing this triad: the rubbish problem, safe drinking water, and our commitment of ‘leaving only footprints’. The ‘mountains’ of rubbish that have been left behind by hikers and climbers in the Himalayas is quite shameful. Even the removal to mountain dumps to burn is causing all kinds of toxic pollution. As we have researched the rubbish problem in the Himalayas and learned of the subsequent problems, we have also come across lots of local and international individuals, groups and organisations who are creating amazing awareness, programs and initiatives to help. But what can WE do as a family? 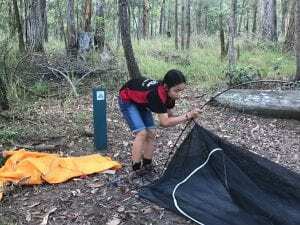 We never leave any trace behind when we hike in Australia’s National Parks, so why would we in Nepal? We wouldn’t. But there is a problem we have contributed to in the past…. On our last overseas hike in China’s Tiger Leaping Gorge, we bought bottled water from the guest houses along the way. We had to, as bottled water isn’t a choice in China like in Australia, it’s a necessity. Although we didn’t litter the empty bottles along the trails, we did leave them in the guest house ‘bins’. But where did they go after that? The third bottle in the video helps save the planet a little by being recycled…but often in mountain areas there are no official ‘recycle’ programs. So how do we do this when the water is not safe to drink? 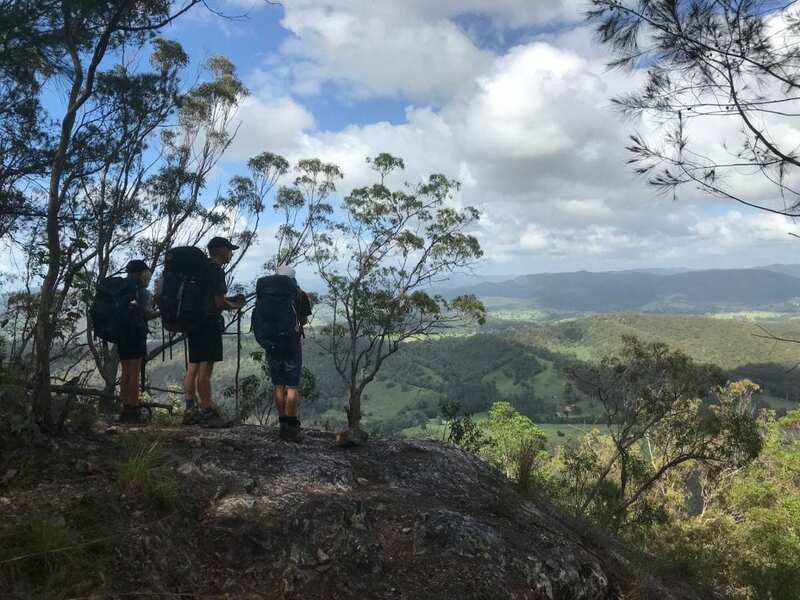 A bonus is that as we already have experience hiking in the wilderness, so we already know a little about the different ways, and their pros and cons of treating water. Kids and I have also been reading about what other trekkers in Nepal are doing. 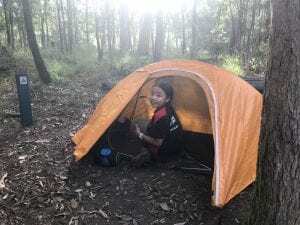 We are fortunate in that we invested in a SteriPEN a few years ago when we started taking the kids on extended hikes. 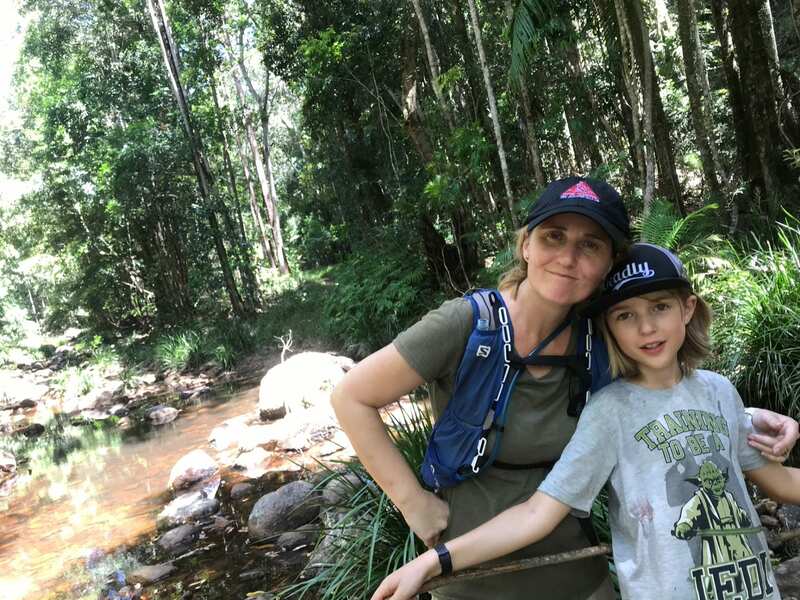 Here’s Aurora using our SteriPEN to treat creek water on our Hinchinbrook Island hike. The UV light of the SteriPEN kills bacteria, parasites and viruses, and doesn’t change the taste like iodine tablets do. The downsides are that the pen requires batteries, spare batteries can be heavy while hiking on long hikes (obviously still having to carry out used ones). The pen kills stuff, but doesn’t filter…so the floaty bits and sediments will still be in the water. It could fail/break, in that case you need a back up! SteriPENs work best when treating 1 litre of water at a time. So we have a sturdy 1 litre bottle that we fill up with creek or tap water to treat, pop our Steripen in for 90 seconds, and voila…treated water. We usually then fill our backpack bladders with this, repeating each time till full. But in Nepal we plan to have a water bottle each that has an inbuilt filter. 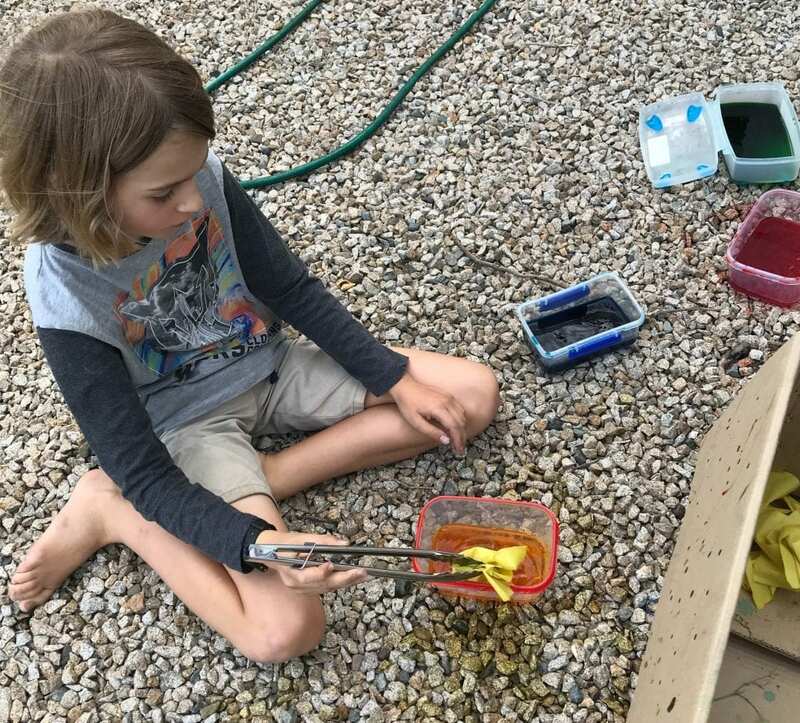 We can then pour our treated water into our individual water bottles, this way our filters will then separate those sediments of the already treated water that the SteriPEN cannot do. We will also take Iodine tablets as a backup for if the SteriPen breaks. 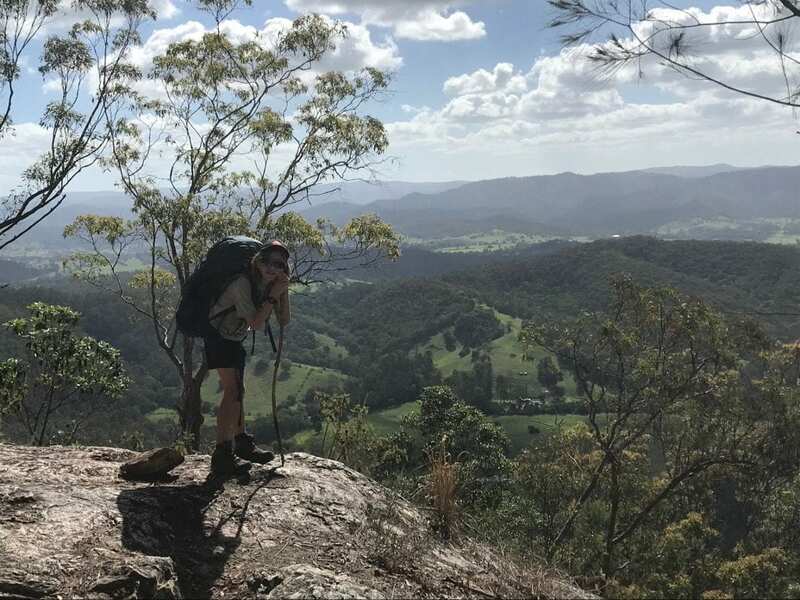 The time to repeat the treating process every few hours on a hike, and the extra weight to carry the Pen, spare batteries, and iodine tablets, adds a little inconvenience to a trek. But we feel worth it to do our little bit to reduce the plastic pollution in this area of the world. 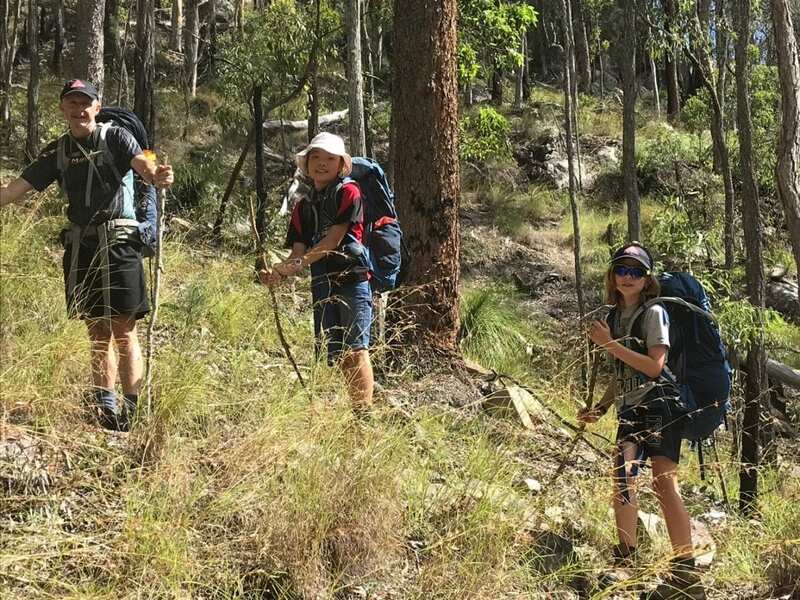 Many other hikers are doing this too…if every hiker did this imagine the reduction in rubbish on the mountains…. Do you think we can do the ZERO BOTTLED WATER CHALLENGE????? None of the online Nepali courses or YouTube channels are working for us! 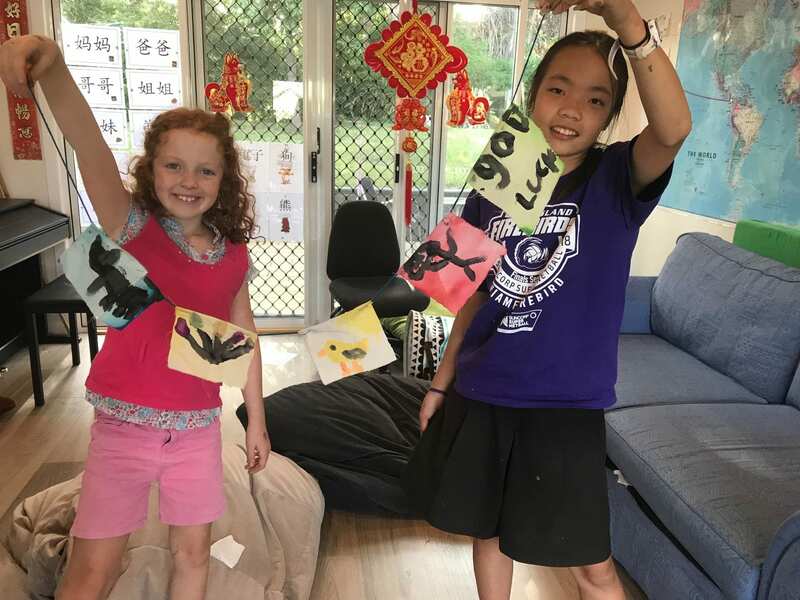 We were trying to find a ready made, kid friendly course…but all we could find were random phrase memorisation style programs, or isolated grammar videos. There was one free course, developed by the Nepali Peace Corp that does seem to scaffold Nepali in a way that helps you build on sentences…and explains the grammar so that you can learn how to put a sentence together and substitute words to say what you actually want to say!!! But it is so old it looks like the pdf download was actually scanned from a document typed by a typewriter!!!! It is not a kid friendly course at all. I originally dismissed it for this reason….But it may be all we have to work with to help us build our Nepali! 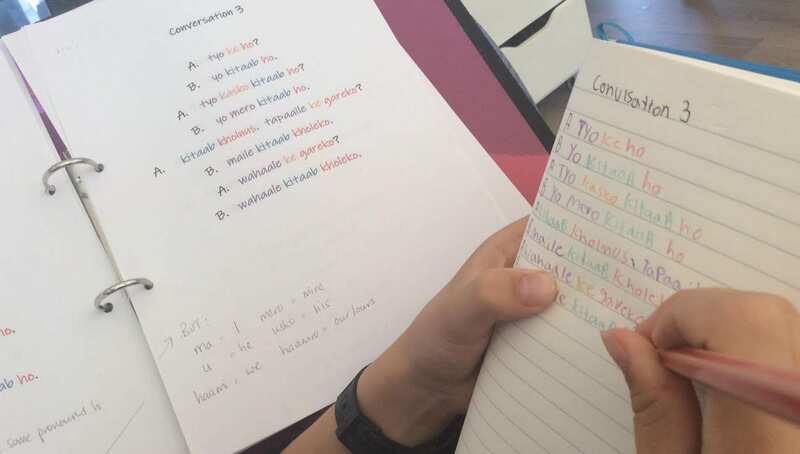 SOOOOO…….I have spent the last week following the course myself, learning the aspects of Nepali grammar and memorising the sentences, and starting to get a feel for Nepali word order, and how the pronouns and verbs work in different sentences. I’m a language teacher!!! 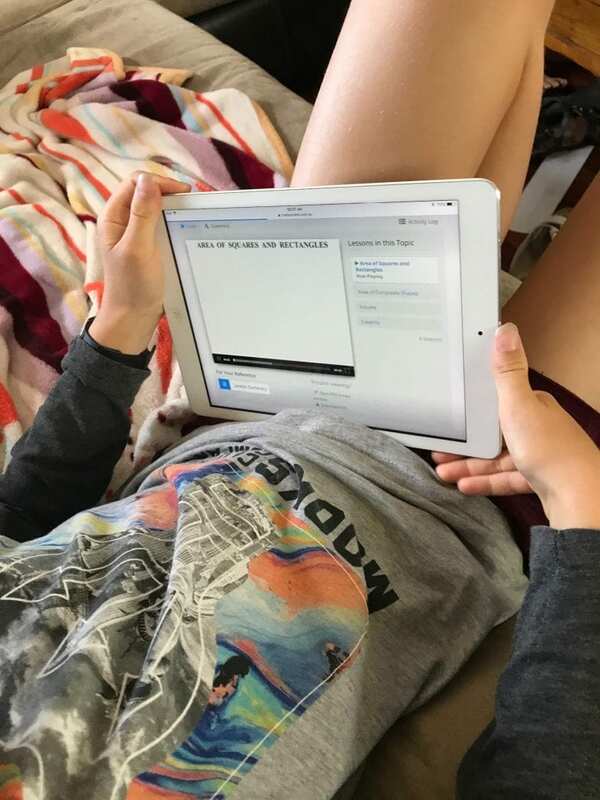 So I am learning 1 step ahead of the kids, and creating our own resources to learn together in a more kid friendly way! kitaab kholnus. tapaaile ke gareko? kalam dinos. tapaaile ke gareko? tyo jholaa dinos. tapaaile ke gareko? 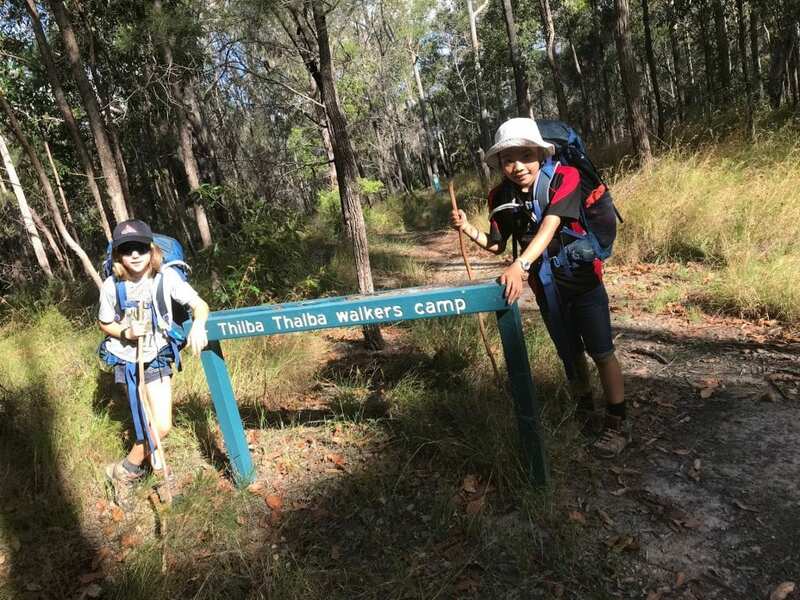 Kids have been on quite a few extended hikes now carrying packs, including Hinchinbrook Island earlier this year. 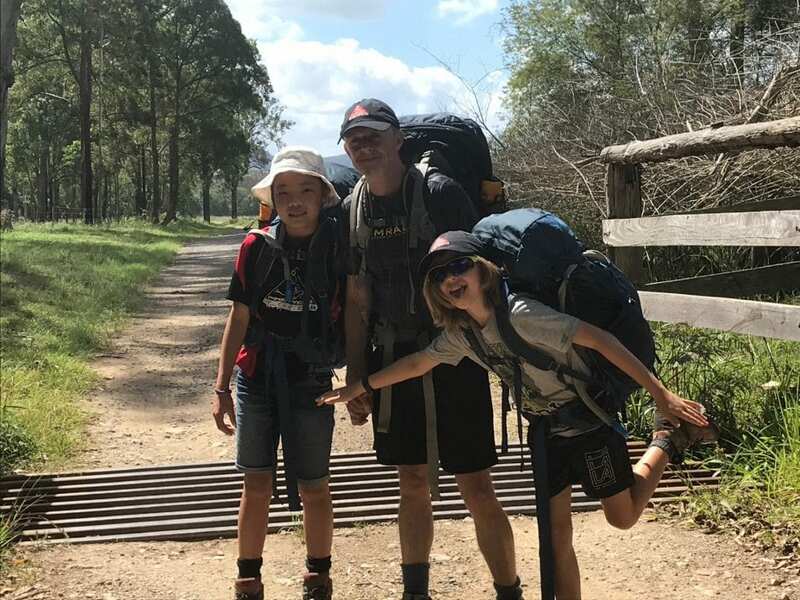 But while they have been little people, we have had a really light 4 man hiking tent to enable the 4 of us to do these hiking trips, and distributed the weight of all our gear and food so that the kids only had to carry about 5kgs each, gradually increasing it as they got older. 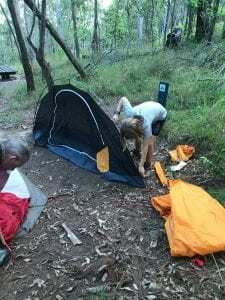 This is the first time that they have had their very own tent to carry, so they were pretty keen this time to carry all their own gear, clothes, food and water! 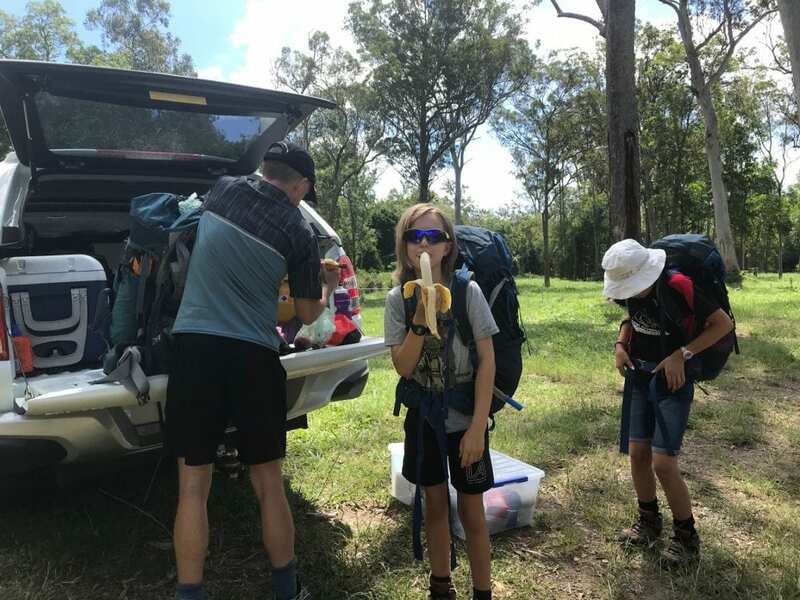 They packed their own packs, didn’t weigh each item (like we did for a maths activity when we packed for Hinchinbrook), just used their common sense and spatial awareness learned from previous hiking adventures. Their packs ended up being about 8kg each. 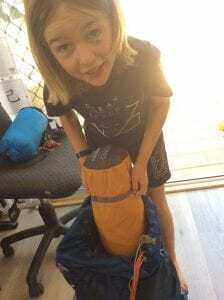 Kids also pitched their tents, and pulled them down to pack into their packs themselves. 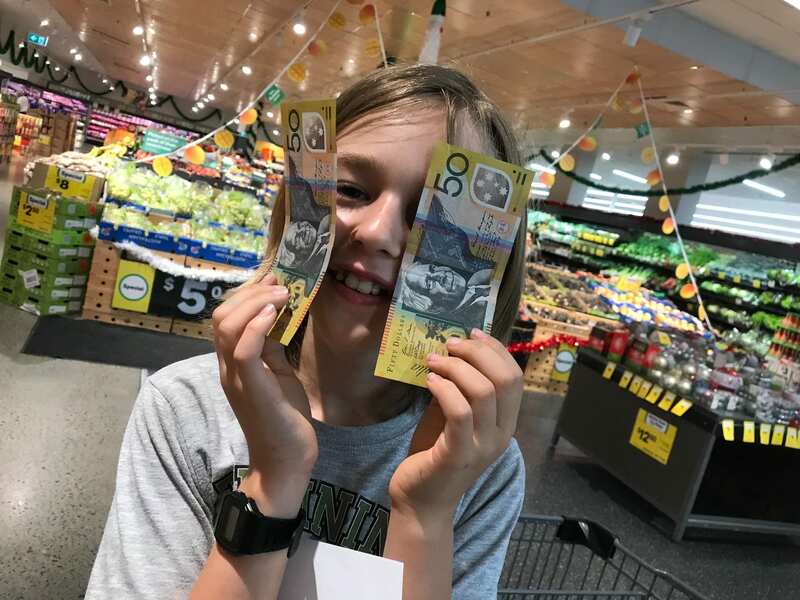 So now Lucas’s turn…$100 cash for 5 days worth of meals, breakfast, lunch, dinner and snacks for the whole family 🙂 Click on the link for full details of the challenge. His list for stuff he has to buy, and stuff already in our cupboard he needs to pay proportionately for. Just like his sister, he made a video of his shopping trip. He’s made lots of animation videos before, but this was his first time chopping and editing video footage in iMovie. 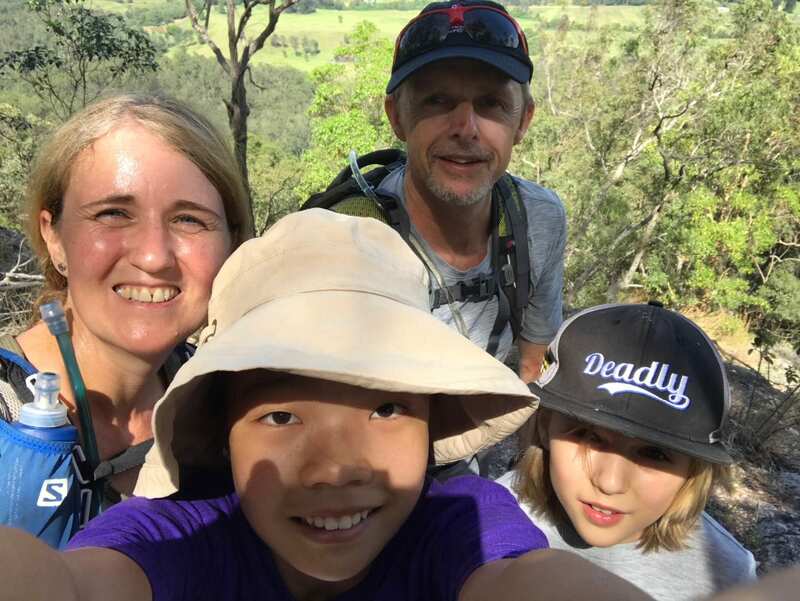 Preparing for our Annapurna adventure and recording all our learning from it is helping the kids learn how they can achieve their own goals. Undoubtedly ‘money’ is a necessity if your goals are adventures like going to Nepal to hike around a mountain! 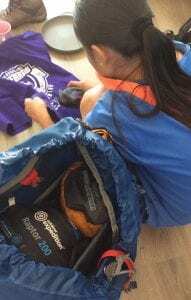 Kids have been working hard to save money for the gear we need to hike safely in Nepal, and have already saved over $500! 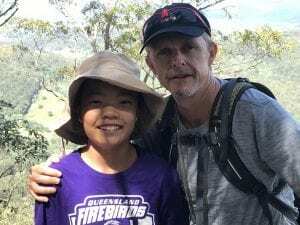 But we will also have to think about a daily budget for meals and accommodation while we are on our trek….to make this trip affordable for us we must set a daily limit. 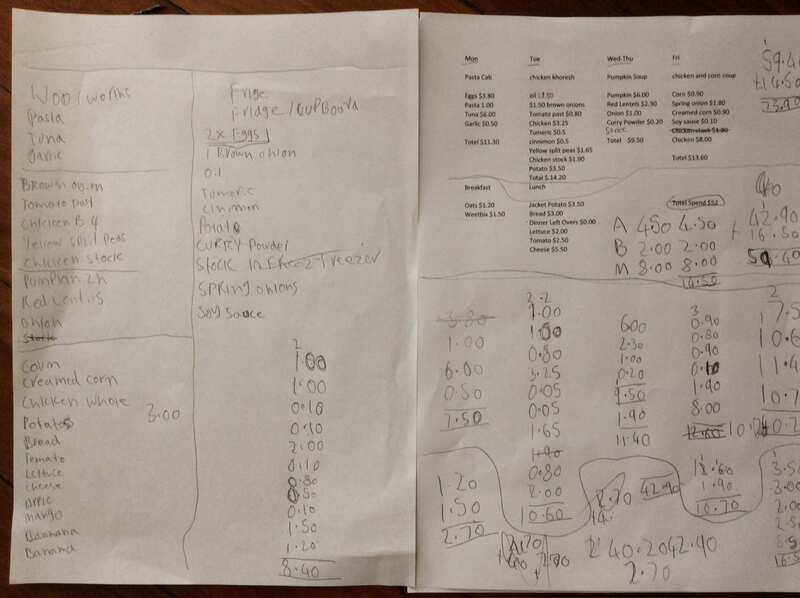 Planning and managing our meals/snacks for the whole family from a Monday to Friday, with $100 budget. 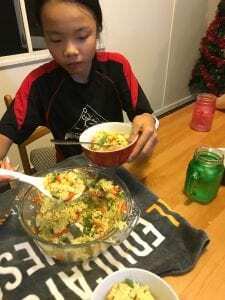 Lucas’s challenge: Mon 17th Dec to Fri 21st Dec.
Plan breakfast, lunch, dinner and snacks for 5 days (Mon -Fri), with $100 budget. Shop for the food for the 5 days’ meals. Manage the food allocation to all family members, including cooking dinners, allocating lunches etc for the 5 days. If food that we already had in the fridge/cupboard was used, the cost of the item will need to be added to the expenditure. If spices/condiments used, then a proportion of the cost added eg. spoonful of curry powder might be 20 cents…as it is impossible to buy new condiments for all meals within the weekly budget. Kids get to keep any money left over! 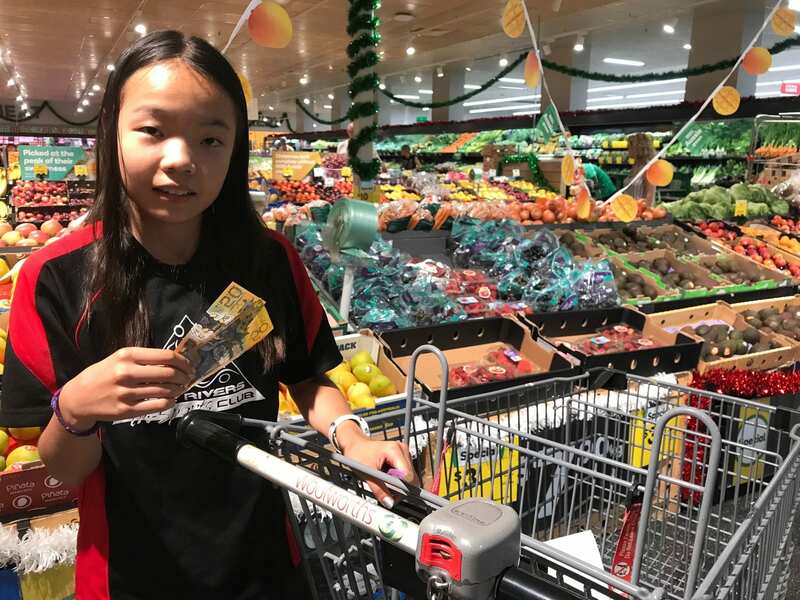 Aurora was given $100 cash, and off she went to the shops (with Lucas helping her). 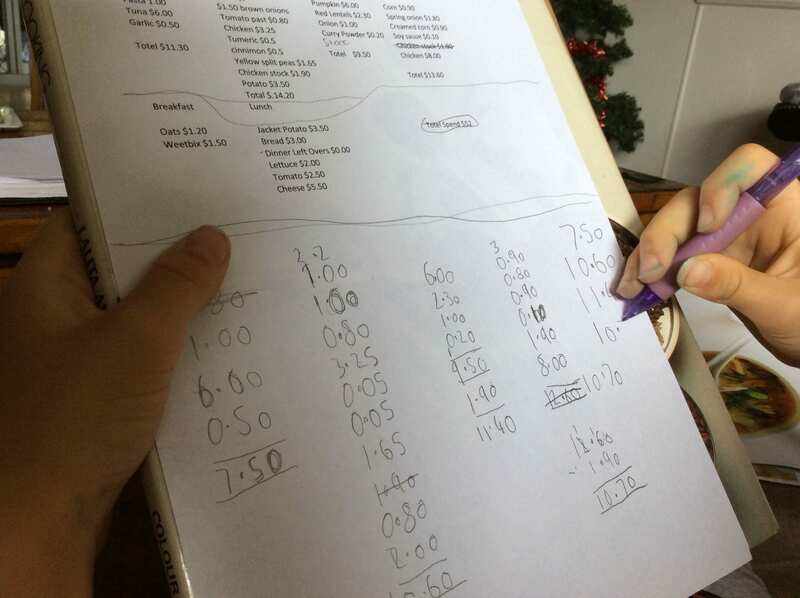 Her shopping bill was $61.80. 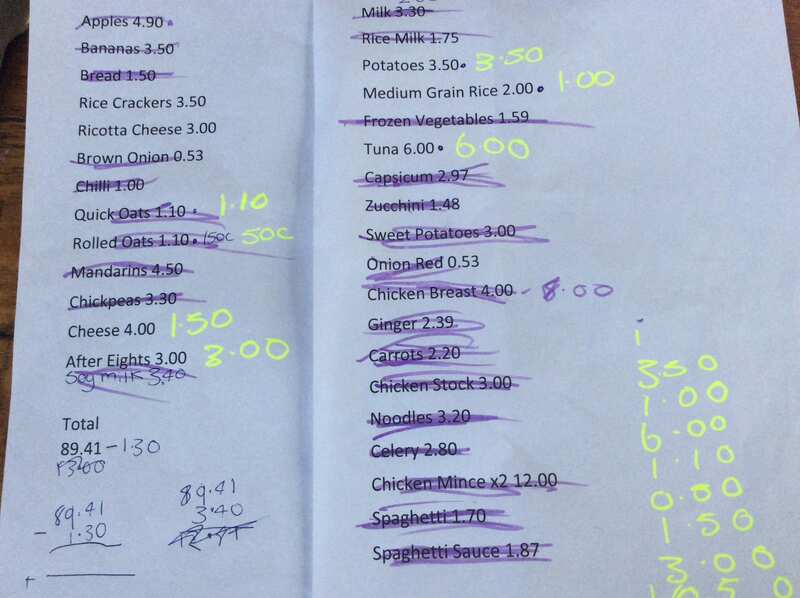 She calculated that she was going to use $16 worth of food we already had in the cupboard. So she came well under budget…and has $22.20 as a buffer over the week in case she underestimated the amount of food we need 🙂 …or gets to keep it if we don’t need anymore food! 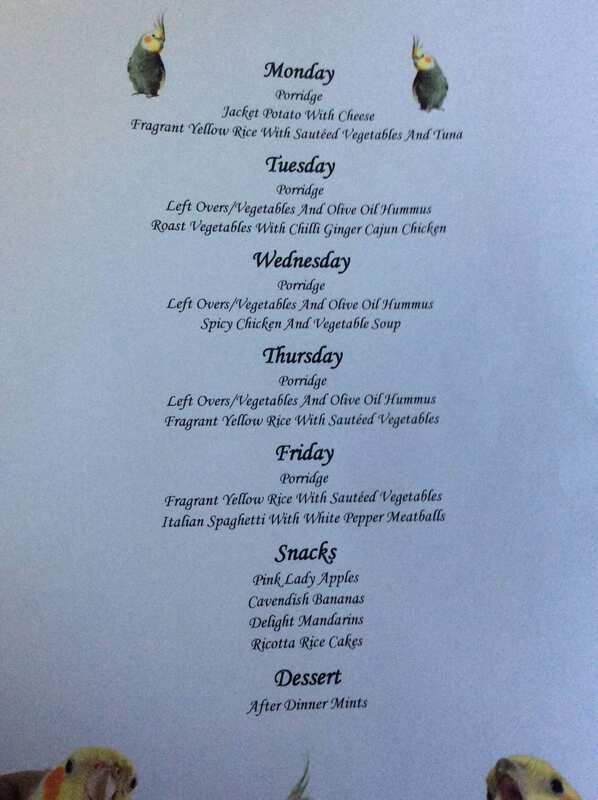 Awesome job up to now, but how will she go over the week with the food that she has bought???? Will we starve? We will have to wait till Friday to find out…. 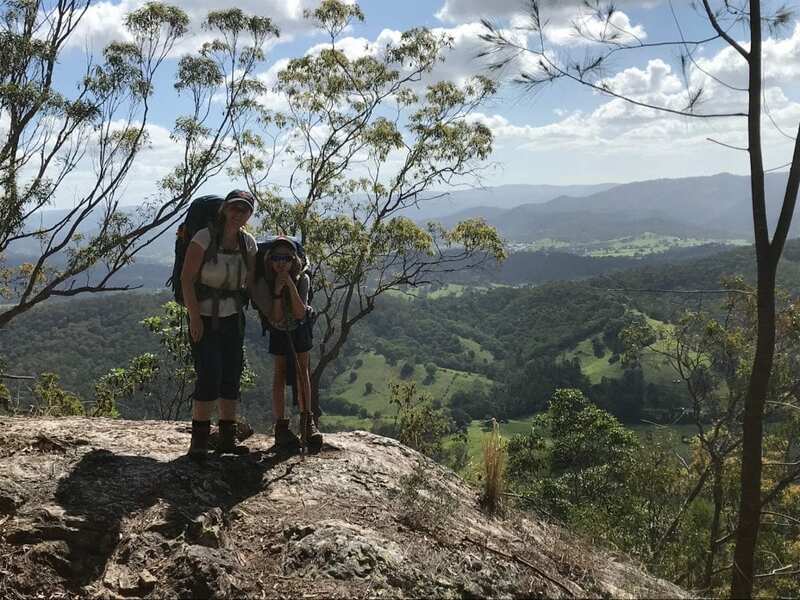 We are ramping up our training for Nepal, this weekend pulling up a little sore after a 22 km walk in Mapleton National Park. 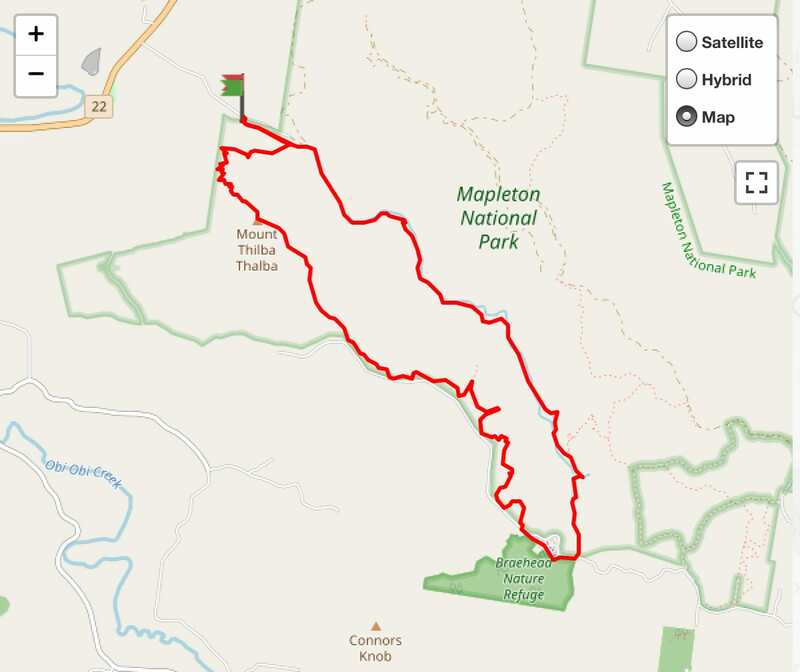 We decided to do a 22 km circuit that forms part of the Great Walk, and part of the Blackall 50/100 trail run. 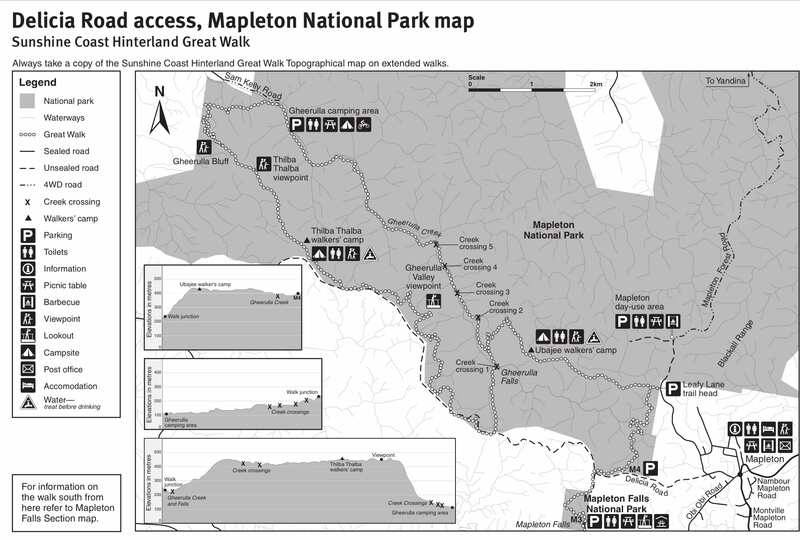 Here is the National Parks’ map for this section of the Great Walk. And here is a map Lucas mapped for us with google maps to map the section that we would be tackling this weekend. 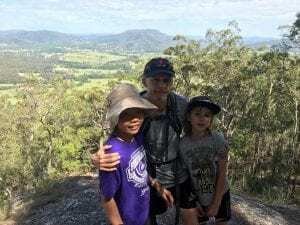 We parked our car at the end of Sam Kelly Road, so that we got to conquer the daunting ‘Gherulla Bluff’ right at the start with fresh legs, shade and morning temperatures. Last time I ascented this Bluff was during the Blackall 50, after already running 20kms and in 11am heat…it took me 2hrs to reach the top! 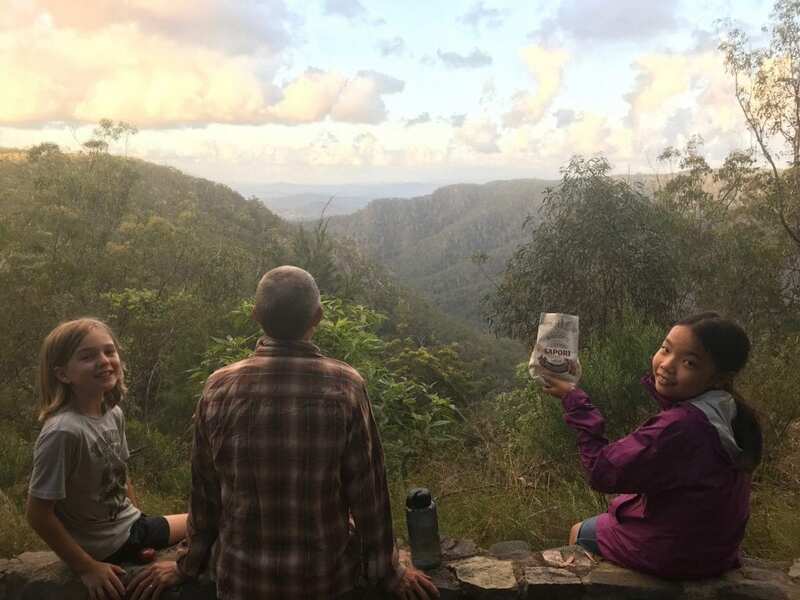 This time it took us 1 hour to reach the top, and 6.5 hrs to complete the whole circuit, including a couple of refreshment stops, and potato salad to give us some much needed energy! The track is unforgiving, hilly and hard on the feet in many sections. It’s uneven and rocky, needing a mental alertness each step to place feet in the best position, the impact giving your whole body a physical workout. 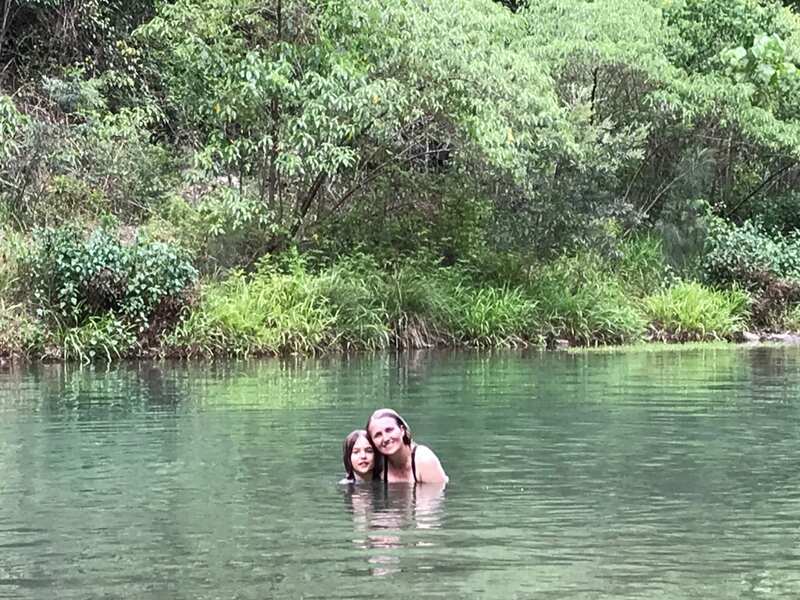 Creek crossings were a bit dry, but enough water to dip our hats in to cool down 🙂 After rain, crossings require good rock hopping balancing skills, or just wading through. 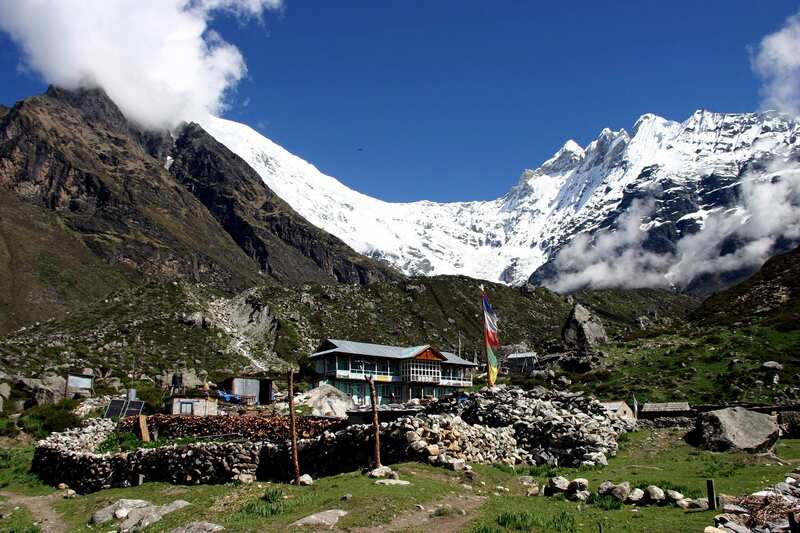 Our goal of trekking around the Annapurna is our ‘Everest’. We have been reading biographies of Alyssa Azar (youngest Australian to climb Everest) and Jordan Romero (youngest worldwide to climb Everest at 13!!!!! ), sharing their journey of achieving their goal, and inspiring kids to go for their own ‘Everest’ whatever their dream might be. We learn so much from their stories, from their experience travelling new cultures, planning, failing, hard work, training, safety etc., and especially BALANCE. His poetry is awesome, he’s not just good at poetry though, he has a passion to rally all of his generation to help change the world for the better. He gives good advice, not just about metaphors and similes 🙂 But also about the importance of well being, balance, and BREATHING…did you hear in the above poem…Breath In, Breath Out :-). His saxophone playing, his long distance running training, his tennis playing, are not just other interests, they contribute to to his mental and physical health, a balance that makes the ideas, the words, the creativity, the nerves of ‘slamming’ all possible for him. It is this BALANCE that we are focusing on as we read Solli’s poetry. 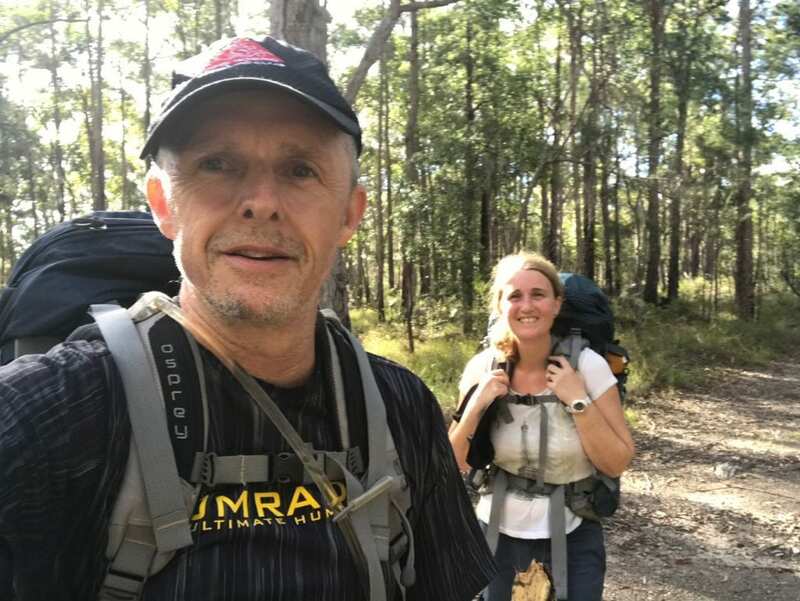 We’re not all great poets or Everest climbers…but just as we can achieve our own personal physical goals, playing with and being mindful with words can help us to transform those goals from the words of a ‘training plan’ to discovering our goals on a more personal and emotional level, from within. We are going to try and write our own poems about our journeys, but first we are exploring the genre of SLAM. Slam is like the RAP of poetry. So to get us warmed up, we thought we would learn a RAP. 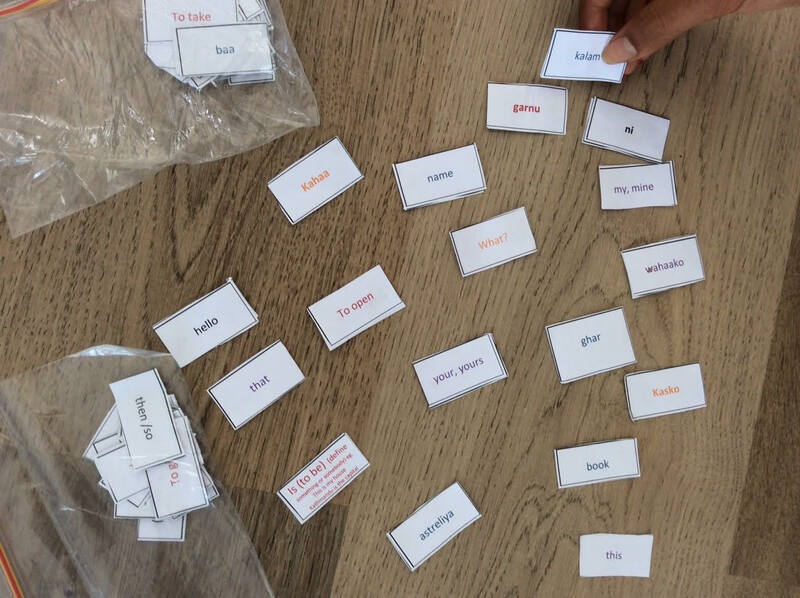 But, as we need to maintain our Mandarin while we learn Nepali, we thought we would learn a RAP in Mandarin 🙂 Our goal to trek around the Annapurna is about having a goal that will keep BALANCE in focus, a goal that we can integrate all our learning areas with a focus on our inner, local and global ‘Well being’. So we are learning a RAP in Mandarin about having a ‘Balanced Lifestyle’. Memorising this rap, and making a video to go with it, will help us to talk about the topic of having a balanced lifestyle while we achieve our goals, with friends in China. And of course it integrates LOTE, English, Health, Music, Arts and Technology. It will help us to share bilingually what we think is important to achieve our goals. 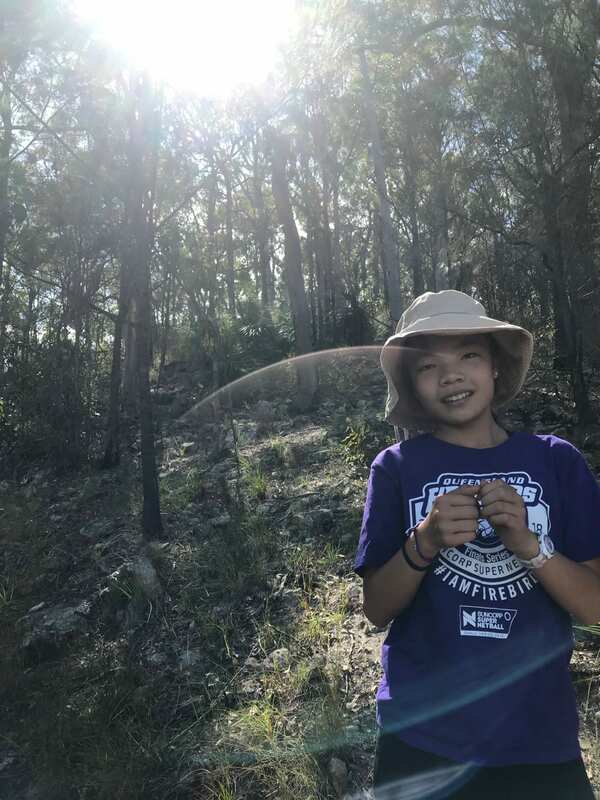 We found the site Mandarin Rap Podcast for learning how to talk about some deeper topics in Chinese through learning Rap! It’s a great site, check it out! We found a rap about Lifestyle Balance on the site. Here is the video of Aurora and Lucas singing the Rap. They added images to help with meaning, as well as subtitles in Mandarin and English. Lyrics in Chinese characters, pinyin and English translation below. Homework and revision are piling up. So busy every day that we’re going round in circles. The pace of life is really fast! They have no way to look after their families. Vegetables, fruit – eat them every day. Give up smoking and limit drinking – that’s the way. Early to bed, early to rise: you won’t grow old! Agragāmī rāṣṭra hāmro, jaya jaya Nepāla! Spread sovereign from Mechi to Mahakali. From the blood of the braves, a nation free and non-moving. Indivisible, this beloved land of ours, our motherland Nepal. This progressive nation of ours, all hail Nepal! Sovereignly extended from Mechi to Mahakali. Bloods of the braves make it free and immotile. One-piece beloved country, motherland Nepal. Progressive nation, I salute Nepal-aa! 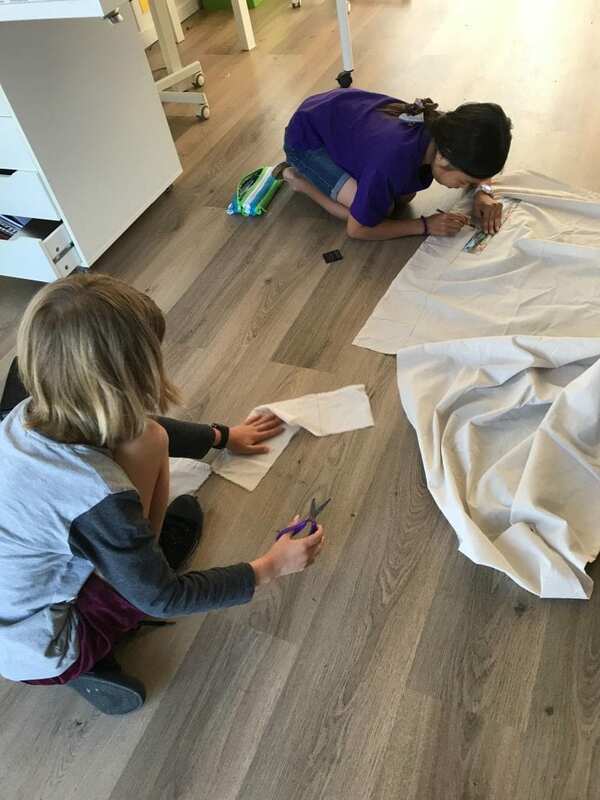 We first had to think of a way to make prayer flags. 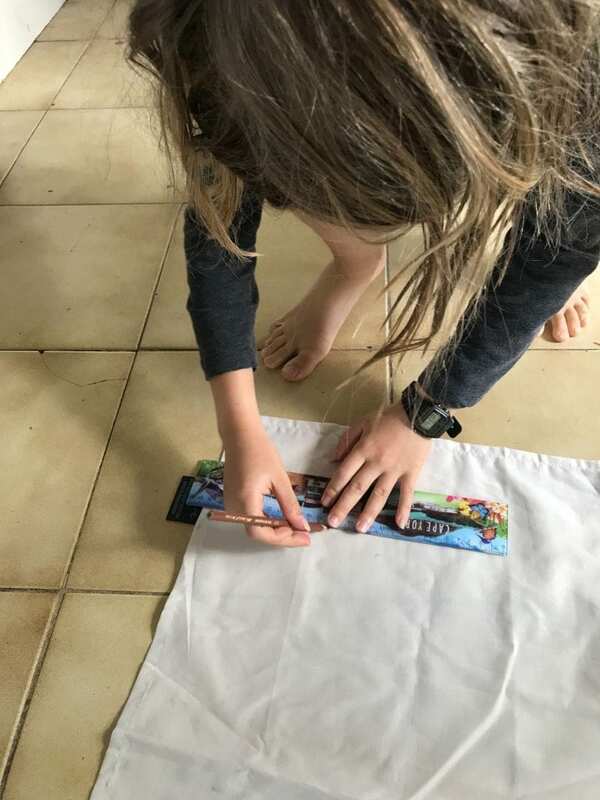 After searching many odd bits of material around the house and estimating cost of buying blank prayer flags, we found an old whitish sheet in the cupboard. Then came a Math problem. 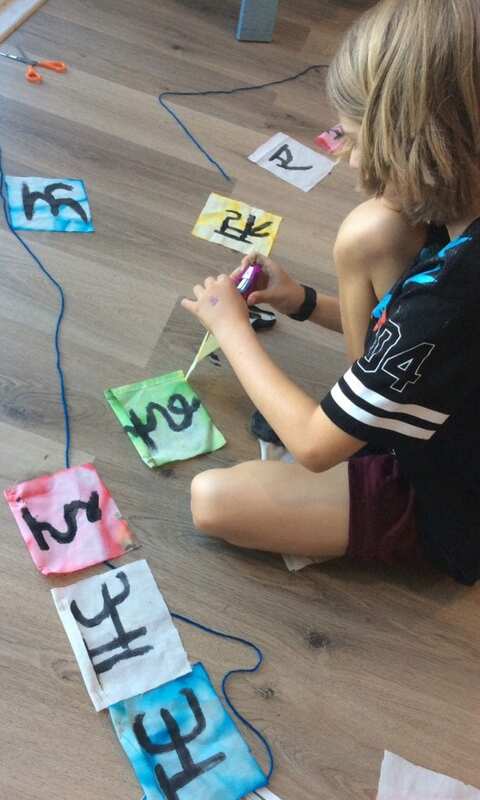 What size should our prayer flags be to ensure we had around 100, enough for Nepali alphabet and some spares for fun wishes. 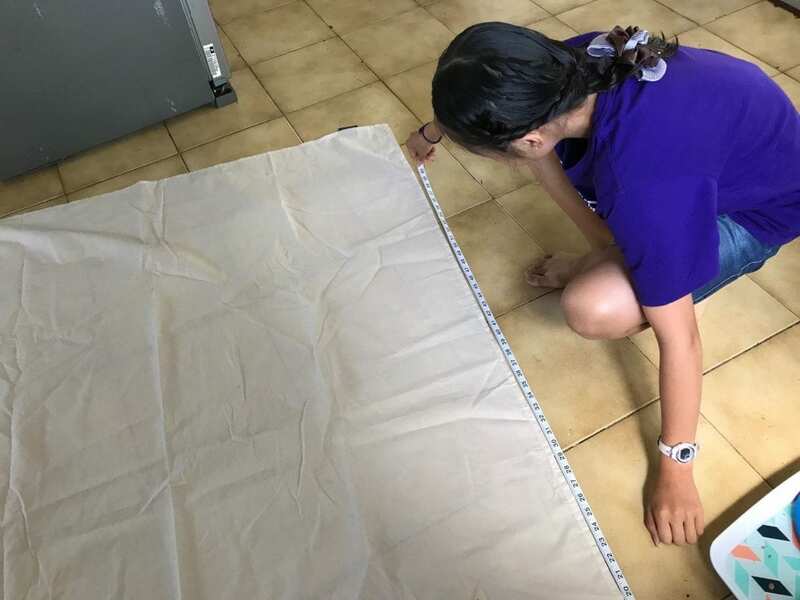 They measured length and width of sheet, 138 and 110 cm. Lucas remembered on his maths online he had done something by adding all the lengths and widths together, and maybe that would help him figure out our problem. 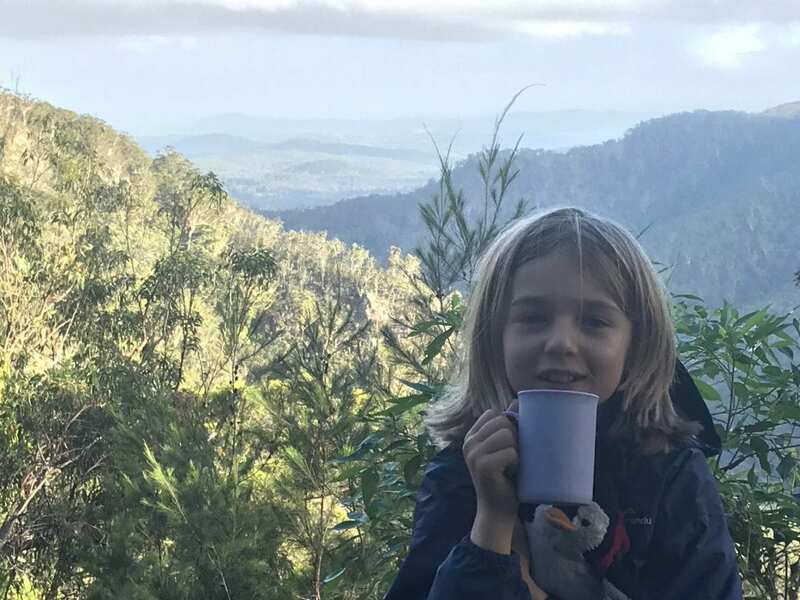 He went onto his maths online program and found that would give him the perimeter. He then looked some more, and recapped the lesson he’d done multiplying length and width, remembering that would give him the area. He calculated 15,180cm square. We needed 100 squares, how would we work out the area of each square, though? 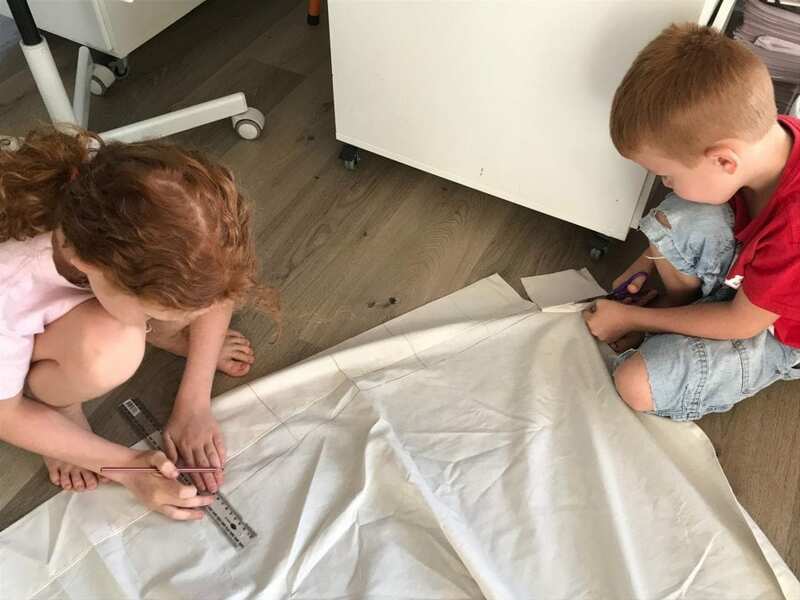 Lucas shouted ‘divide the area by 100!’ I was impressed 🙂 So they worked out each square needed a rounded down area of 150square cm to ensure we got 100 flags. But how long should each flag be??? They figured they could just guess a length, multiply it and see if it was close to 150. 16 x16? too much. Tried 8×8, too little. 14, too much, and so on. 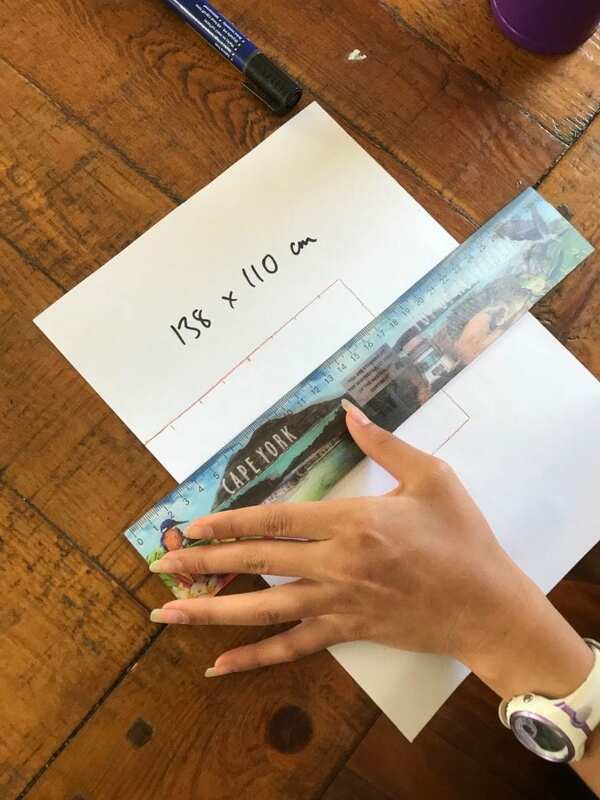 They decided to make them 12cm long and wide. 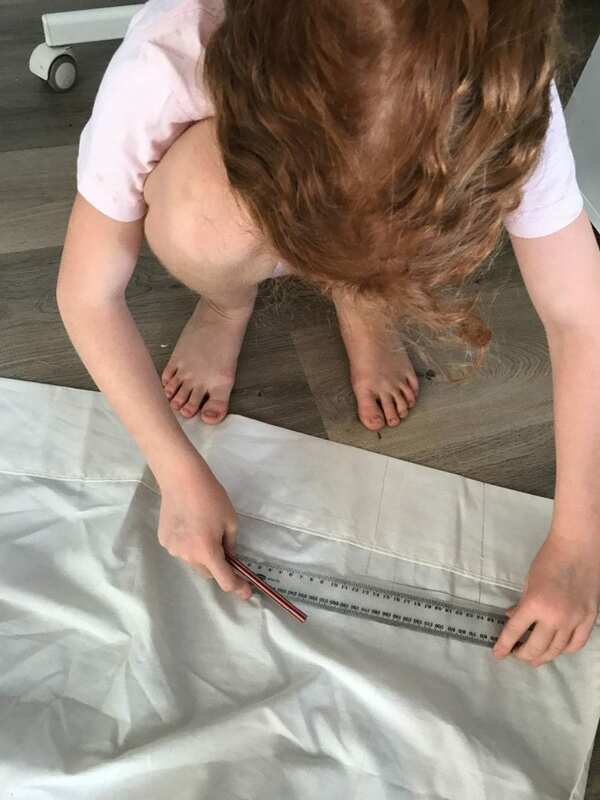 When they measured and cut them, they found they had over half the sheet left…hmmm, calculations must have been wrong. So they made an extra set of flags at 15cm each, as they thought the others were too small anyway! Where did they go wrong? 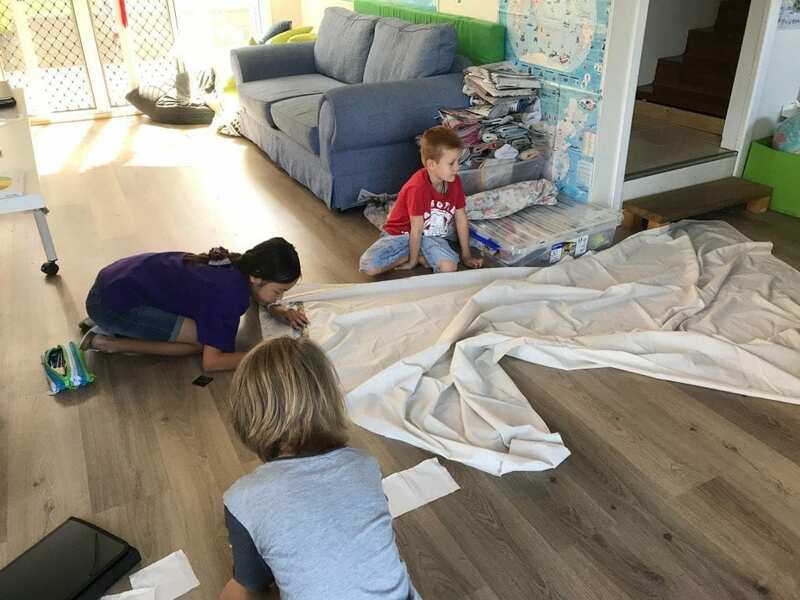 All their calculations had been correct, but the initial measuring of the sheet with the tape measure might have been wrong. Fortunately this mistake left them with surplus flags! 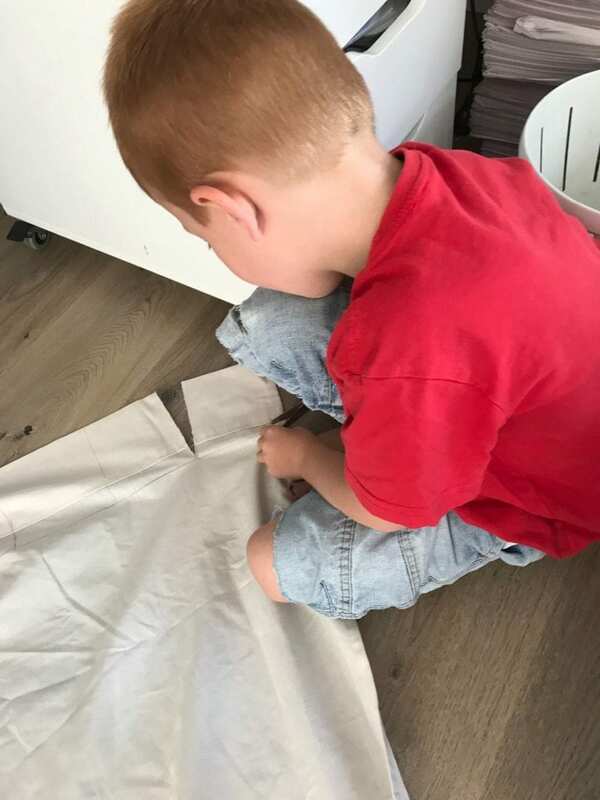 But my controlling this activity for them would have prevented them from making a mistake, one that didn’t really matter in the big scheme of things, but it’s because the mistake isn’t really going to hurt them in any way that it is such an important aspect in the process of ‘learning’. Next was to work out how to dye the flags. 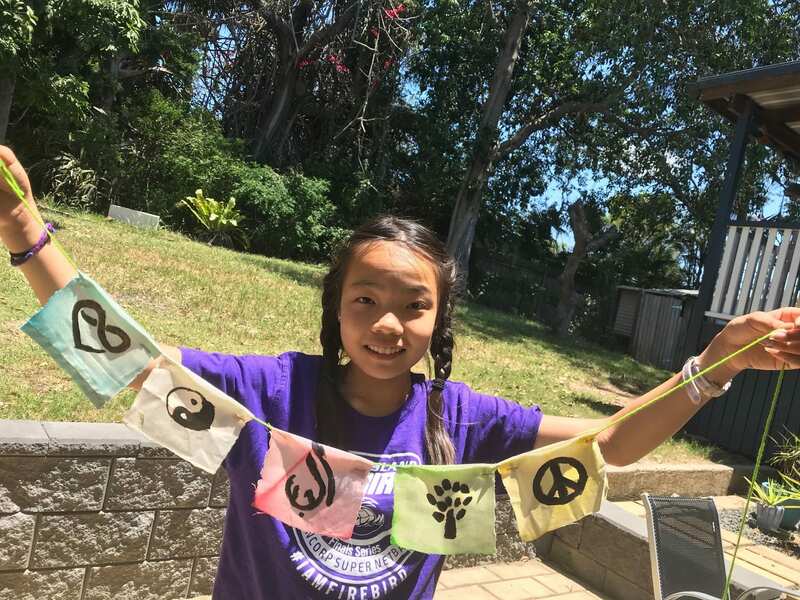 They noticed that our prayer flags we have hanging on our deck, are white, blue, red, yellow and green. 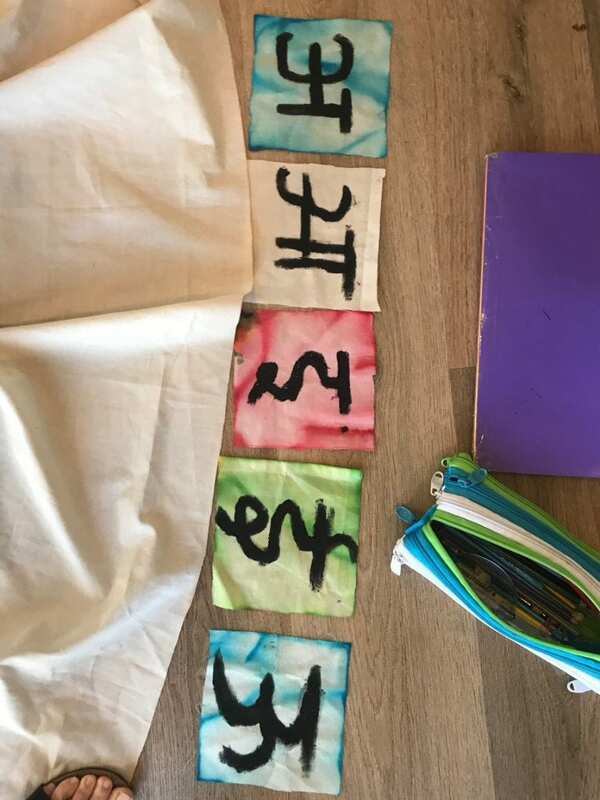 We looked at material dyes online, average price $10 each, we would need 4, too dear for our little project. Aurora researched into natural dyes, we bake using ‘foods’ for natural colours, so she found videos of using natural ways to dye materials. But we worked out once we had bought the foods for all the colours, would be too expensive and time consuming…red cabbage so expensive, then boiling for 2 hours…didn’t sound practical. 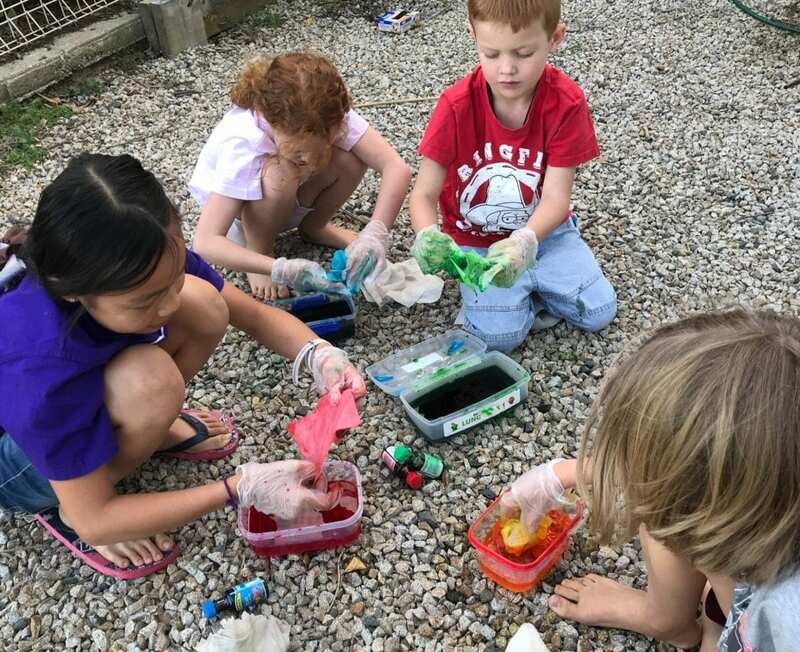 Then Aurora suggested food colouring, which we never buy but figured the cheapest solution for the small quantity of material we needed to dye..we got each colour for $1.14 each 🙂 This took a couple hours of research and chatting to get to this decision…but lots of reading and reasoning to get there. Once dried we could paint the Nepali Alphabet on them. Here’s Lucas using a video he found for painting the vowel symbols. 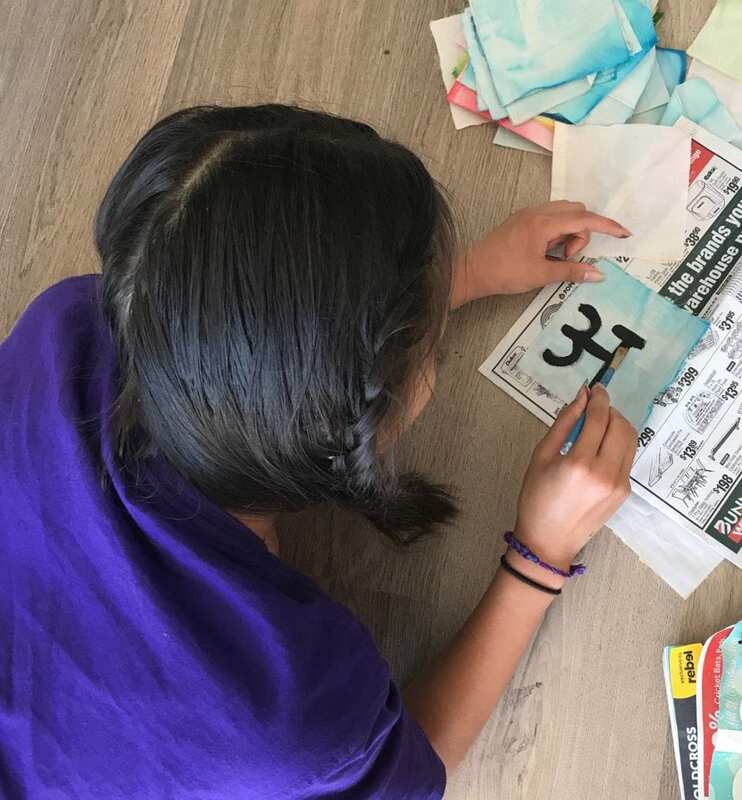 The lady had made the video for teaching the Nepali Alphabet to kids, so we could learn the sounds as we painted. 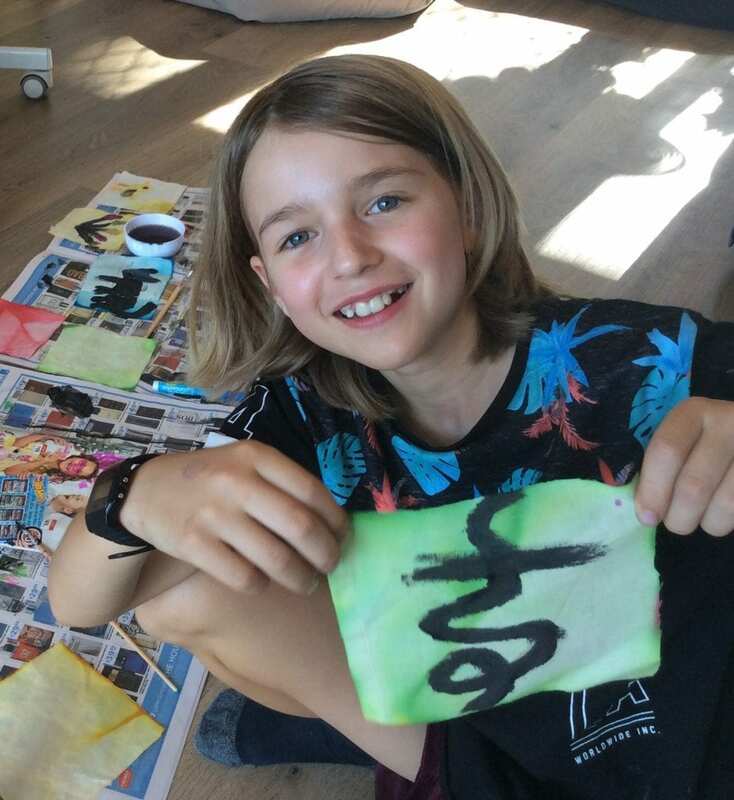 As well as using the ‘concept’ of the prayer flag as a beautiful way to decorate our classroom and learn the Nepali alphabet, we also thought we would paint some with our personal hopes and wishes for our world, to blow into the wind. Aurora painted symbols to spread her wishes of love, balance, strength, nature and peace. 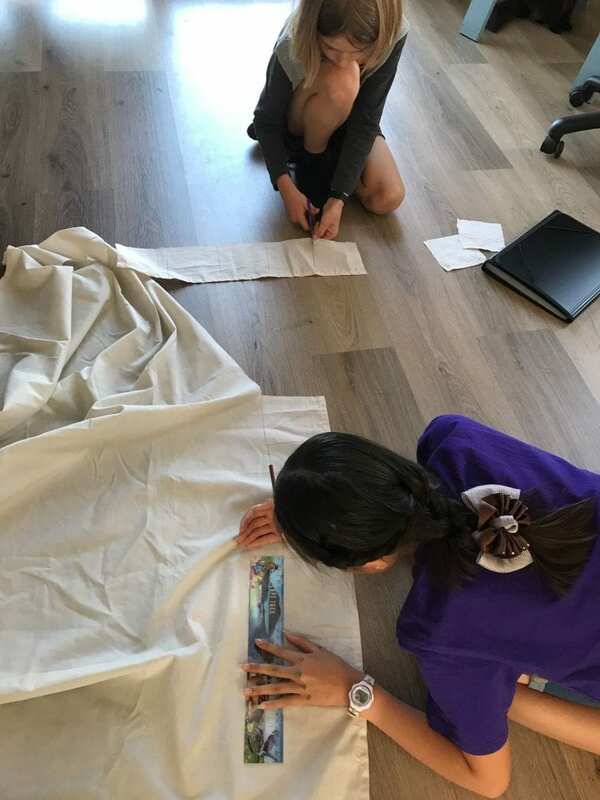 Yr 5/6 Visual Art : Explain how visual arts conventions communicate meaning by comparing artworks from different social, cultural and historical contexts – analysing how symbolic meaning or metaphor is constructed in students’ own artworks and artworks of others.